has two Masters Degrees and has published numerous technical papers as well as several magazine articles on toy castles. He has searched the world in his quest to discover new and old toy castles and knights. 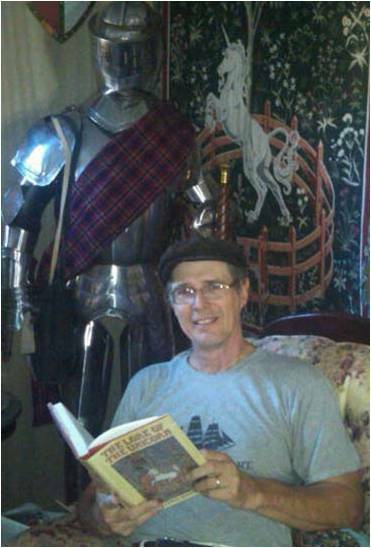 He has also published one book of rhymed story poems, and is completing his second. He lives in Northern California with his childhood sweetheart and several long-coated German Shepherd dogs. If anyone should know castles. Its Joseph Svec. Readers will recall his Toyknights.com adds in past issues of Playset Magazine. He opened several stores selling castles and knights from across the globe so he has a first hand working knowledge with which to fill his book. Full color photos from Marx to the great Elastolin castles and keeps, an uncommon special set by Walmart of Germany, the list is quite extensive. He puts to rest that Simba Castles (in two sizes) also came out as Supreme, and shows many figure groups that previously were probably undocumented by Dom, Tomb Warrior and many others. The book is quite current enough to feature Barzso's sprawling castle and Abby with knights and merry men: readers will enjoy matching up their obscure or unmarked castles with the many represented here. One Marx castle is colorfully shown with several cartons and Robin hood related figure groups. Chapters covers significant castle themes, castles by countries of origin, with titles like Robin Hood, Sword and Sorcery, King Arthur and Camelot, Germans Toy Castles, French Toy Castles, British and European Toy Castles, American, Exin and many more. It is an entertaining mix of the 1950"s with the new, plentiful pictures and full color throughout it's 102pp with soft cover.